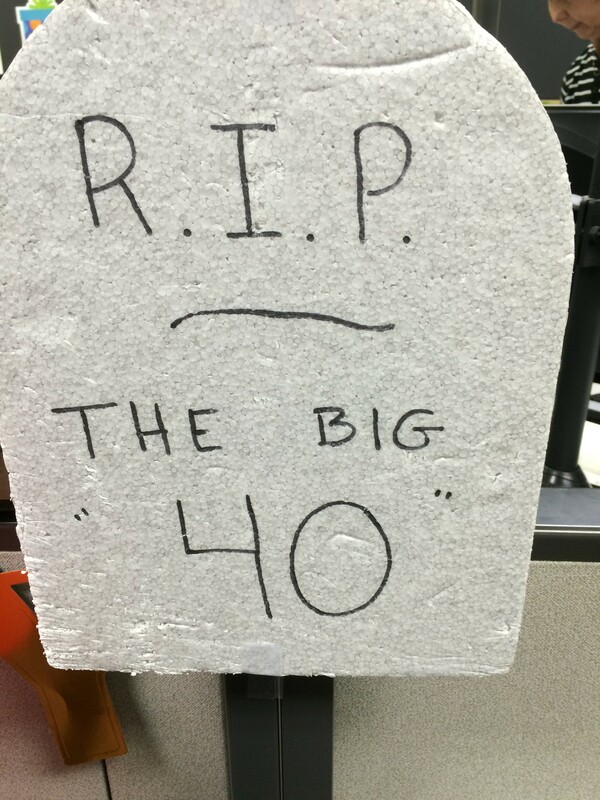 So six weeks ago I turned 40, people at work put a tombstone on my desk (pictured), and we all had great fun at my expense. Then a few weeks later a normal cold (well upper respiratory infection), combined with a spicy chicken meal (I had no business eating), made me violently ill. Since then I’ve changed my diet and feel so much better but damn I’m getting soft. I enjoy naps more, I get tried more easily and enjoy not the finer things but the slower things in life. As an African American man you gotta figure I’m about halfway through my life, my father barely made it to 75, his father only made it to 72 and my other grandfather did make 86 but not in good mental shape. Already I’ve outlived my eldest brother by five years. So I’m basically at the halftime show right now. I also feel more of my father than ever, good and bad and that whole midlife crisis thing is for real. You know I’ve been chasing a sports car for months. Now I have an infant son that I love to death but my goodness little man wears me down. I’m a year older than my father was when he had me and that was back in the 70’s. I played baseball the other day with my wife’s niece and nephew and somehow fielding a ball I ran lips first into a pole holding up a bird feeder. Felt like a French kissed a mailbox while in a car doing 35 miles an hour. My lips are still sore days later, first thing I did was take inventory of my teeth. Actually first thing that happened was people were concerned because I fell. When you older and you fall, people get scared. I mean I’ve torn an MCL, a meniscus and had a couple of concussions, none of that the other day, just embarrassed and dirty. You get up slowly, when you are young you pop up like a jack in the box, when you older you take your time because you are sore. You look around and cuss under your breath and think “man this is gonna really hurt later”. It used to be I could fall hard and be fine, damn near get hit by a car and be like superman and get back up and the car is damaged. Now when you fall you just moan, hell I moan a lot, when I sit down, when I get up, my wife calls it “old man noises”, my father used to make those noises and I made fun of him. Now I make those noises. But you know what’s great, you have a lot of experience. You can see problems coming, you have a expert nose for bs and you know even when people scream the sky is falling that its not and if it did we all dead anyway. You also don’t have to appease anyone, you can be yourself, be cranky, be silly and who the f--- cares? You’ve earned the right to now have to be phony. You have more leeway to say what you want and do what you want and if people get mad “oh well”. That is what I love, combined that I get to pass that on to my kid and be the crazy black dad like my dad used and get away with it. Its awesome but its sad because so many brothas didn’t make it to this age, that haunts me all the time. I think of my friends Marcus & Rahn gunned down over 20 years ago and that the violence hasn’t stopped. But we move on and are grateful for those of us who have reached our milestone birthdays.